With this post I wanted to do a full overview of my mast, which I’ve spoken some on before. This will provide instructions on how to build as well as archiving things in case I need to rebuild it in the future. 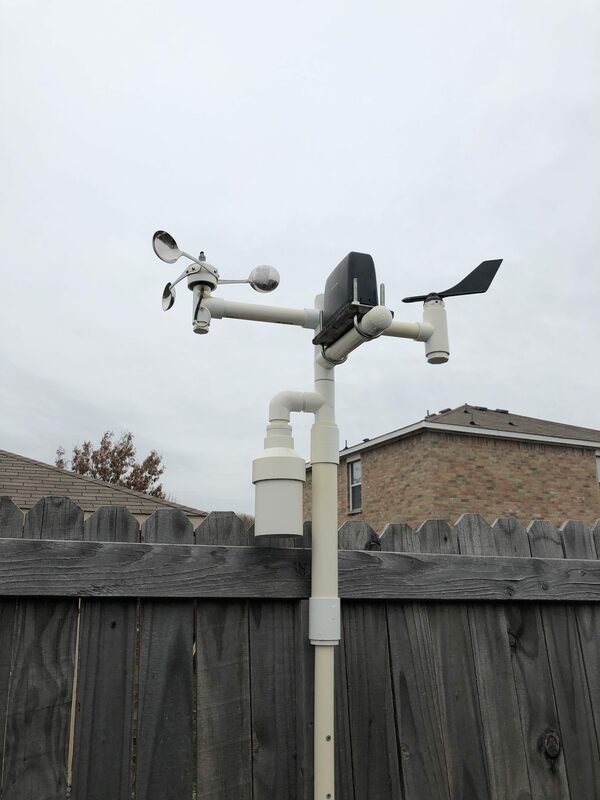 (I just had to re-wire everything and it was pretty difficult remember and figuring out where everything went) The mast is only one part of my weather station; the enclosure, which houses some other sensors as well as the RPi, will be in another post. The way my weather station works is the mast gathers info from the 5 sensors that are contained on/in it via the micro controller. It then sends the data to the Raspberry Pi that resides in the enclosure via I2C to be archived, along with data from the other sensors, within my database tables. The mast is built out of PVC. This allows me to attach my homemade sensors easily as well as protecting the micro controller that resides inside that runs the sensors. Most of the mast is made from 1″ PVC with different connectors and such. There are a few places in which the 1″ is not used, for example, where the micro controller resides. (You can see it as the larger section). It uses 3/4″ PVC inside 1.5″ PVC. It is built this way to provide some waterproofing for the micro controller. The other section is for the temperature & humidity sensors. It uses some 3″ PVC as a sun shield for the sensors. As for the wiring of the sensors, I will detail that a little later, but all the wiring for the sensors comes together at a point where the larger section starts. It’s there where I “harness” everything together and will detail that later. As I said, there are 5 sensors within the mast. 3 are sensors I have built myself and two are not. For the sensors I have built myself, I have linked to the posts in which I detail how to build them. In previous versions of the mast, I have used an Adafruit Trinket board, but when I attempted to add some additional sensors (which failed miserably due to waterproofing) it didn’t have the needed pins required, so I switched to a Arduino Pro Mini 3V. The Pro Mini is slightly larger, more powerful and allows me to power it with 5V coming from the Raspberry Pi.